Every summer I traveled to my second hometown, Donetsk, to see my grandparents with my mother. Looking back at my memories as a child in Ukraine fills my heart with bittersweet nostalgia. A lot of things in my life trigger my memories of Ukraine. One of the simplest things, like to catch a faint whiff of dill, instantaneously evokes in me a vivid recollection of my grandparent’s house, it was like a gateway to the past, a flashback to my great and active and childhood that I feel so blessed to have had. Summer was always accompanied by scraped knees and purple-stained fingers. Our neighborhood had a huge infamous Mulberry tree right in the middle of it that stained the ground with purple spots, and reaching out to the highest branches (with the tastiest and most ripe berries) was always risky because they left indelible stains on my clothes! Being sort of a jungle kid I encountered many risks. I lived and spent a large portion of my childhood time outdoors; climbing trees, building tree houses out of branches and scraps of cardboard, rope-jumping with friends, learning how to ride a bike, swinging on monkey bars, playing badminton, and mingling with different kids and neighborhood folks. I’d spend all day outside playing from early morning ’til noon, stepping inside to eat lunch, then bouncing back out again. My childhood experiences in Ukraine shaped me significantly and also helped me learn more about my Ukrainian culture and way of life. I remember being known as the gypsy girl because of my dark-haired/eyed look compared to everyone else, the “Arab” from an unknown far away land. At the end of every playful and adventurous day I was an exhausted, worn out but HAPPY kid with dirt on my clothes and bruises on my legs. Then the day after, I’d repeat it all over again and so on. Waking up to the sound of an orchestra of rustling leaves and pigeons cooing on the balcony, I tugged on my grandpa to take me out with him then to get me that delicious waffle ice cream that I always loved and still do. I never had tastier ice cream in my life! There were two benches next to our home from where my grandpa always watched over me so that I didn’t run out of his sight. “Don’t go past the keet!” he always warned. The “keet” used to be an outdoor swimming pool in the playground, and all that’s left of it is a stone in the shape of a whale. The mystery surrounding the disappearance of the pool had to do with a drowning incident..so they say. Beyond the keet was stepping into a danger zone for me, a restricted area that I didn’t dare to cross over. I even remember feeling like a dare devil whenever I attempted to go past that “forbidden” point with my friends. My grandpa frequently took me to the town’s bazaar and bought me gifts. 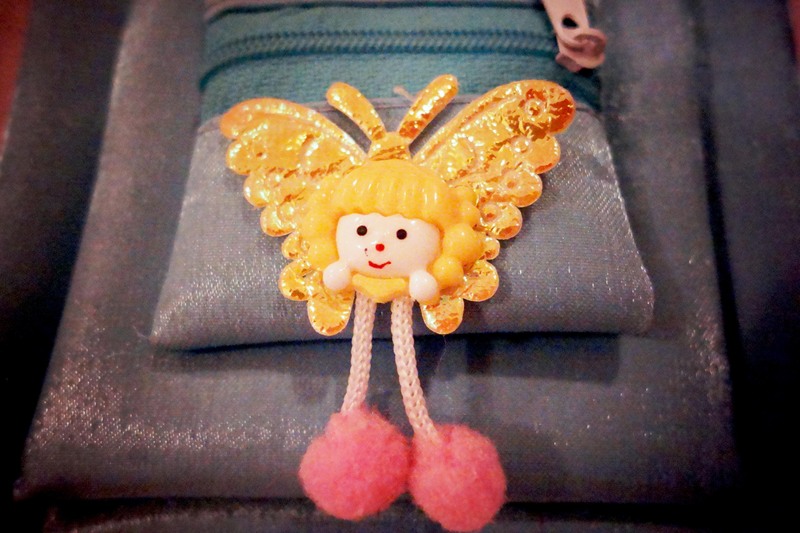 I still hold on to that cute little blue purse he bought me with an angel or fairy on it. I remember when having a tamagotchi was the craze for kids in the neighborhood, it was a cool gadget to have and everyone suddenly wanted to be your friend. There was a particular one I really wanted; a big, baby pink heart-shaped one which was a rare find. Grandpa promised to go to the bazaar with me to search the whole market for it, but we never found it. He got me an even cooler one with a keychain, that I also kept until this day. Then I’d come back home to the scent of my all time favorite, grandma’s hearty Ukrainian Borsch soup. I’d put on an apron just like the one she had and help her prepare the ingredients, chopping those veggies and stirring the pot. I loved helping out my grandma in the kitchen, and I always imitated everything she did! Sometimes, if she wasn’t too tired, I would beg her to go outside with me and pick out her outfit and choose the color of her lipstick. I loved playing dress up with her. On weekends we took trips to the Black Sea along the winding roads overlooking endless sunflower fields and a clear blue sky. On our way there all the sunflowers were facing the East and going back home at sunset they’d be facing the opposite direction. Sometimes we’d stop the car and sneakily grab ourselves a sunflower and pick the seeds inside it. Actually, they taste better raw than they do ripe! As years of memories passed by, my grandparents passed away and it’s been 8 years since my last visit. I knew that if I ever were to return, the place would not be the same. That is the most depressing part. Now this very place is a war-torn zone, the same place from which all these dear memories came from and still remain untarnished in my mind. The neighborhoods have turned into a ghost town, most Donetsk residents escaped and moved out, some fearing for their lives and hiding in their homes. What was once the sounds of birds cooing and childrens’ laughters in the morning has been replaced with the loud bangs of firing and explosions. Armed thugs wield rifles and clubs . It feels like only a moment ago that everything was okay, and it was only a moment ago that I was proudly looking at pictures of Donetsk’s newly built airport that served as a sleek symbol of progress. Now it is completely destroyed and what is left of it is a wasteland of rubble. The airport does not stand today. It is just a heap of rubble. I would never have imagined that this was going to happen to Donetsk one day, no one did. And it deeply saddens me to see the state it is in right now and I really hope that it returns to the beautiful city it always was.